New to the board, hoping someone can help me. I am trying to identify what I believe to be the face of a very old calculator, circa 70's or 80's. Unfortunately it was butchered by someone for a project and there's no identifying marks, except for a part number on a circuit board on the back - EACA P-1104A. If anyone can help, it would be appreciated. It looks like it had some sort of speaker and I've never seen keys for "S.T." or "A.T." on a calculator before. Cool. Looks kind of like a alarm key panel than a calculator though. There are a ton of old calculators on there, you may be able to nail that one down since you know when it was made approx. I doubt it is a calculator. Calculators have minus, multiply and divide buttons. I think this in fact the controls for an alarm system. I worked for some time in the early '90s at a company that manufactured alarm systems. 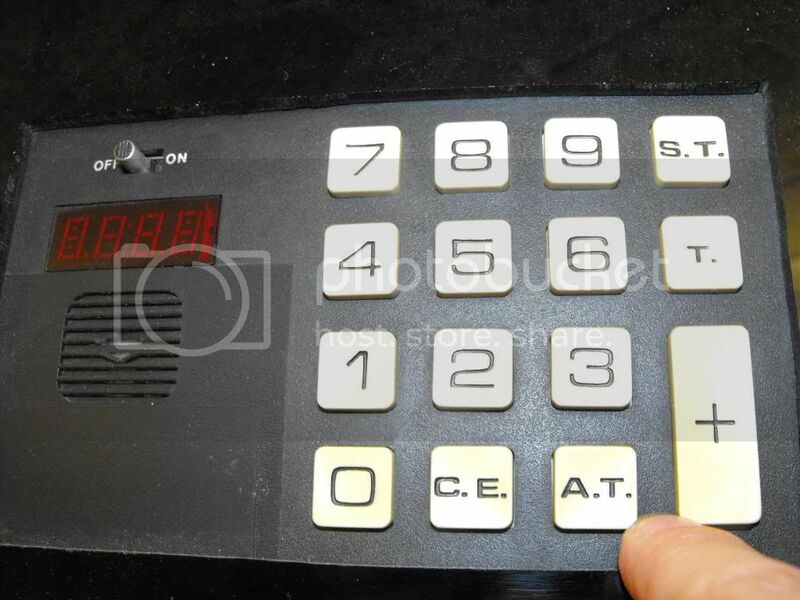 I would have to agree that it appears to be the keypad from a pre- 1990's alarm system. Even the older systems (late 1980's) I repaired had more than a 4 digit LED display. The two dots between the 2cnd and 3rd digit have to be for a time display. No idea what the other 7 dots are for. "T." probably stands for "Time." A.T. = Alarm Time? S.T. = Set Time? Not sure why there's a + key on an alarm system. Now that you have that information, how do you think you would achieve the next part? Was I just accused of plagiarism? Anyhow, I fear this mystery will never be solved. I really searched google for a couple hours, using the circuit board numbers as well as the abbreviations on the face. I even "walked" through a virtual tour of a fire alarm museum! If my life depended on knowing this, I would try to find an old engineer who worked on fire alarms and ask him to look at it. It certainly looks old enough to have been produced before everything got recorded on the internet. So all that's left is human memory. this is definitely an early house alaram system. the different settings with the letter codes represent the different levels of securtiy. at that time you could do things like leave the lock on a back door open so your kids could come in but leave all the others protected. to be honest i think security systems have declined in technology over the years. It can't be a calculator, I doubt you could do much counting with a plus only... It's got like a colon visible in the middle of that tiny screen so it might have served for showing the hour. But it's also got more colons, I don't know what for... The date formatted in a weird way? Agreed with most everyone here. It doesn't look like any calculator that I have seen. It does appear to be some sort of old alarm system. Since everyone above has already answered the question I will just point out that this is an interesting thread. Back in the early 80s and 90s my family never had a house alarm but as soon as I saw this image I knew that is probably what it was. Even though everyone above agrees I'm still curious to know exactly what it is. Now I'm going to be thinking about this all day tomorrow at work. I share your thought...already answered, definitely not a calculator, likely a keypad for home alarm system, still curious to know for sure.